christmas time is definitely a time of year for an excessive amount of sweets. if you’re like me, you usually need a salty snack to immediately counteract a sweet snack, or vice versa. chex mix does the trick, every time. make a large batch and package it up to share with family and friends! this is my mom’s recipe, which was handed down for a few generations. according to my mom, this recipe comes from the days before store-bought chex mix. 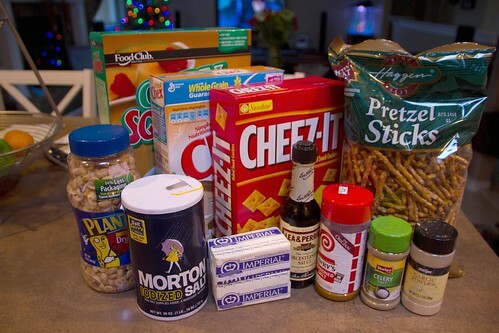 it is much better than the store bought stuff, as most every kind of homemade chex mix is. it does call for an ingredient called accent… which is pure msg. i couldn’t not find it in the store (i can’t imagine why! ;)) i did notice a difference in taste w/out the added msg. i’m sure it is also a ton healthier. i did substitute salt, but again, it wasn’t quite the same. 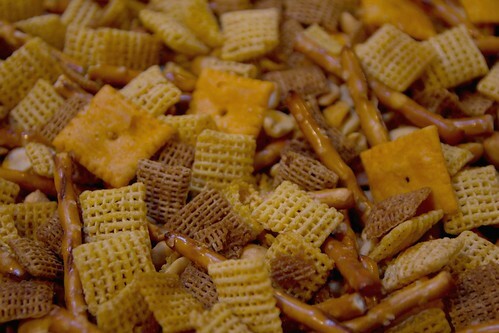 in a large roasting pan, stir the cereal, cheez-its, pretzels and peanuts until evenly distributed. pour margarine mix over cereal mix. stir to evenly coat. bake for 45 mins, stirring every 15 mins. cool and place in an air-tight container.